Blonde haired Mike Sarne was studying a language degree at the time he cut his first single. Few people on hearing 'Come Outside' would have believed that the 'cockney lad' singing it was an expert in Russian. This first disc featured the voice- though not the singing- of a young Wendy Richard who would later become a familiar TV actress. Her best known roles have been in the long running comedy series 'Are You Being Served?' where she played the 'brassy' Miss. Brahms and, more recently, for her part in 'Eastenders' in which she plays the part of the 'dowdy' Pauline Fowler- one of the original cast. Mike's second disc 'Will I What' featured another girl, Billie Davis. She would become a pop star in her own right and is particularly known for her cover of the Exciter's classic, 'Tell Him'. The EP illustrated here (GEP8879) is the only one Mike had released in the UK during his time of pop stardom. It is simply a coupling of the A-sides from his first four singles. It also carries an interesting set of biographical notes. Aside from pointing out Mike's linguistic skills and studies, it mentions that Mike's introduction to the stage and screen was gained at the Max Reinhardt drama school in Vienna. He appears to have developed sufficient skills to sustain a long term show business career even before becoming well known by singing any of the tracks on this attractive and collectable EP. Mike's attempts to repeat his success using the same cockney novelty formula gradually grew less successful, but he squeezed four chart appearances from it, staying in the public eye for just about one year. Even a change of accent and the addition of another girl- this time (a Liverpudlian Vernons Girl) Margo't Quantrell- on the supposedly Beatles sounding 'Hello Lover Boy' didn't help. Although he would appear on records again, he turned his career towards the stage and films. With rather less hair than he had in his youth, Mike Sarne still appears occasionally in TV acting roles- particularly those requiring language or dialect skills. He has also appeared in and directed several moving pictures since ceasing to be a pop star. 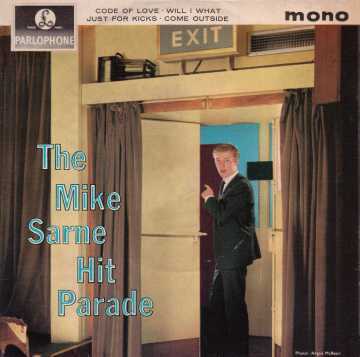 Parlophone GEP8879 1963 "The Mike Sarne Hit Parade"